Hope you can join us for the new challenge starting today at Ooh La La Creations. The challenge theme is Get Well Wishes. It's hard to believe that 6 months have passed since I joined the wonderful ladies on the Ooh La La Creations Design Team. This is my last post for the team and I wanted to make a special card. I was inspired by this card made by the super talented Pauline. To create my card, I selected this lovely image and patterned papers from the Paula Oakley CD. Cut out all the pieces with my Silhouette Cameo. Assembled all the layers, then added a bow and button tied on with twine. Absolutely beautiful Deloris, the colours are so rich. 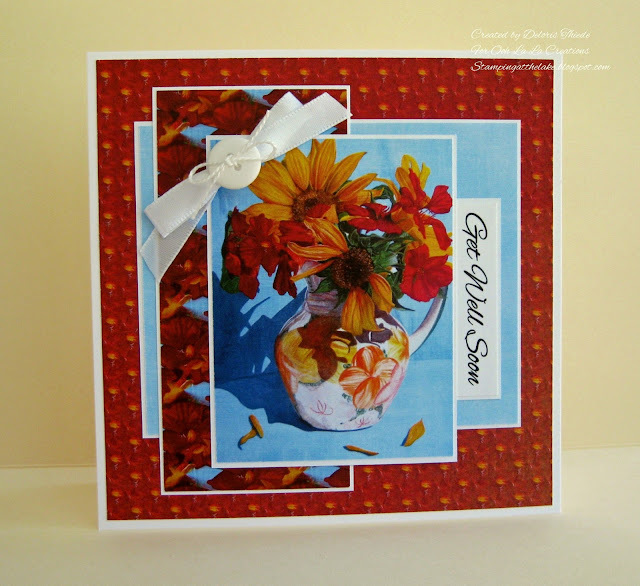 A gorgeous card Deloris, a beautiful image and lovely colours. hello! this is amazing, gorgeous layers and colors! I am so glad you played along with us at simon says stamp wednesday challenge! Gorgeous bright cheery card, love the design and image. Thanks for joining us at Creative Knockouts. Gorgeous card, Thanks so much for joining us at Creative Knockouts. Deloris this is beautifully designed.